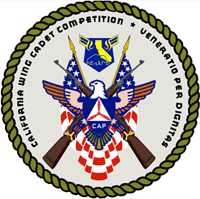 Register for the Next California Wing Cadet Competition (CWCC) HERE! The goal of the Basic Cadet School (BCS) is to provide the new cadet with an entry-level understanding of the Civil Air Patrol program, teach a solid foundation of drill and memory work and, imbue an understanding of their responsibilities upon which the individual may build his or her Civil Air Patrol experience. A working knowledge of CAP uniforms, drill, and a basic understanding of CAP’s history and its mission. A basic understanding of the CAP cadet program, specifically the requirements, opportunities, and awards of Phases I and II. A basic knowledge of the responsibilities and discipline required of every California Wing cadet. Understanding of the Integrated Leadership Program, (ILP), and the knowledge that he or she has just graduated from the first level of that program. Expected performance: Each cadet will be responsible for all the material presented during BCS and will complete and pass both the workbook and final examination. Basic Cadet School is the first step in California Wing’s Integrated Leadership Program (ILP). BCS is the foundation of the ILP and the first exposure cadets will receive to California Wing training standards. In order to meet training standards, an environment that fosters within cadets a feeling of pride, identity, and accomplishment should be maintained. Basic Cadet School will provide the new cadet with a solid beginning to understand the responsibilities and rewards involved in the Civil Air Patrol cadet program. The Basic Cadet School supplements and reinforces the Phase I introductory training conducted at the local unit. This program is intended to introduce a new cadet to the uniforms worn in Civil Air Patrol, drill movements ranging from stationary to basic drill while marching, and the missions of Civil Air Patrol, as well as the opportunities available as a cadet in the Civil Air Patrol. For most new cadets and their parents, BCS is the first CAP activity outside their home unit. Therefore, it is important the activity be well-managed, organized, and professional. While high standards for discipline should be maintained during the activity, stress levels should be kept to a minimum so as not to interfere with the learning process. BCS should be a positive experience for both students and their parents. Staff and instructors should conduct themselves in a professional, competent, and business-like manner at all times.